Tuesday September 12 1911 I got Wills packing done so he went away at 9.15. Ida came out later. Rob out to do the chores. And Ott out to spend the evening and talk about business. Will reaches [Delmar?] at 6.40 Wednesday September 13 1911 There was a frightful storm last night. We got little sleep. I went down town an hour in forenoon. Hattie & Cora came out in afternoon Rob took them home in the buggy. 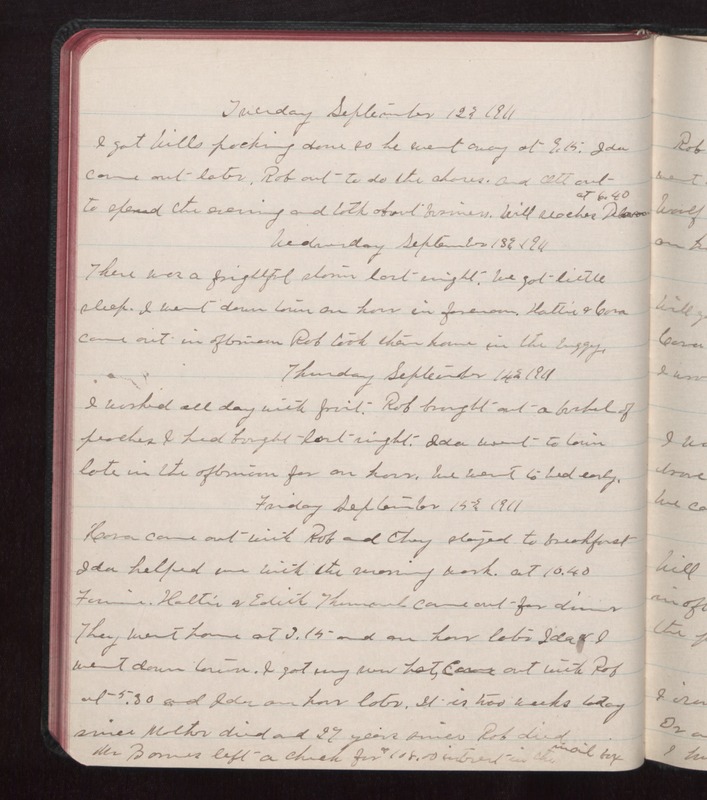 Thursday September 14 1911 I worked all day with fruit. Rob brought out a bushel of peaches I had bought last night. Ida went to town last in the afternoon for an hour. We went to bed early. Friday September 15 1911 Cora cam out with Rob and they stayed to breakfast Ida helped me with the morning work. at 10.40 Fannie, Hattie & Edith [Thurmond?] came out for dinner They went home at 3.15 and an hour later Ida & I went down town. I got my new hat, Cora out with Rob at 5.30 and Ida an hour later. It is too weeks today since Mother died and 27 years since Rob did. Mr. [Barnes?] left a check for $108.00 interest in the mail box.